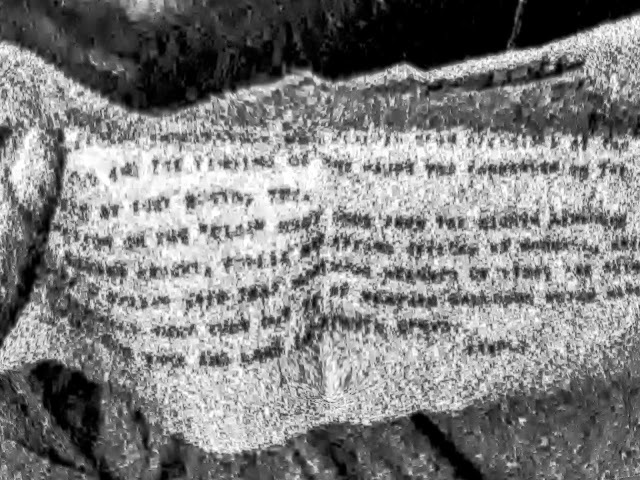 While I'm not sure why it is important in a discussion of the Ramey memo, there are those who wanted to see the scans of Marcel. 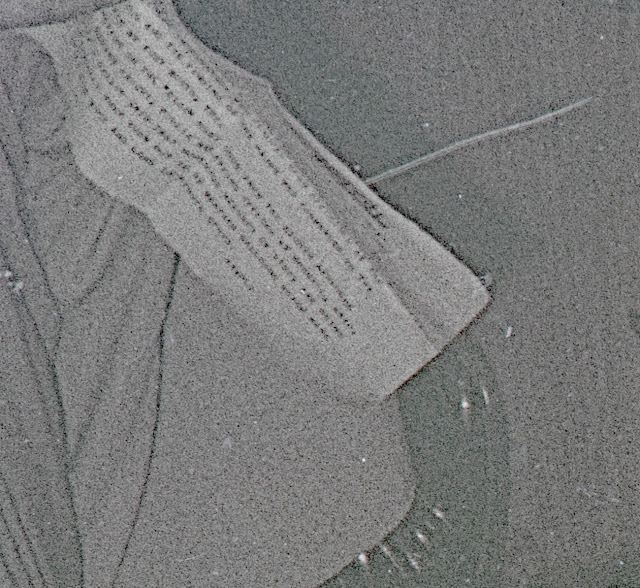 These are the full negative scans and the copyright, as it has been defined, still resides with the University of Texas - Arlington Special Collections. If they ask that the pictures be removed, then I will comply. These scans allow us all to see the full photograph along with the edges of the negatives. I do not believe these have been published before in this form. And, for those who haven't seen the picture of Irving Newton, taken sometime after those of Marcel, Ramey, and Ramey and Dubose, this is the best copy I have. The photo credit that I have on it is the Bettmann Photo Archive, which has been acquired by Corbis, I believe. 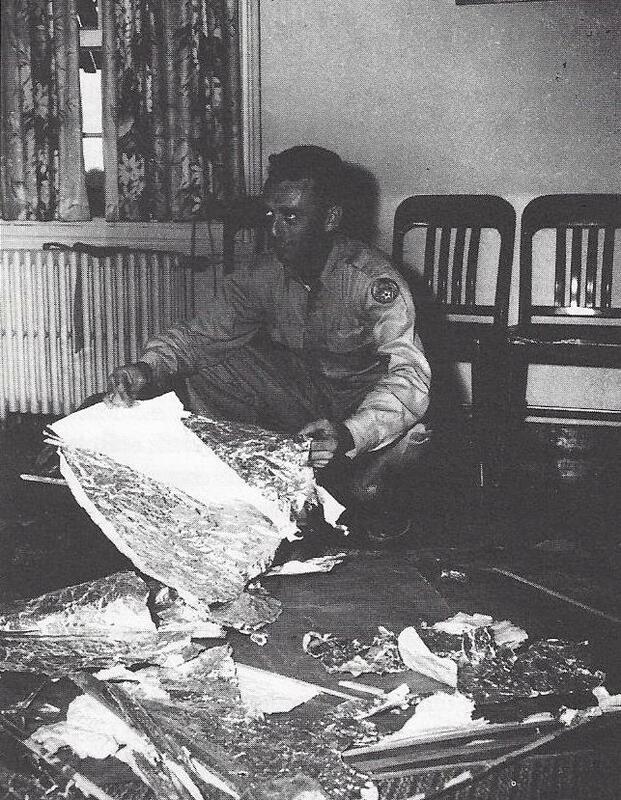 It should be clear to anyone looking at these pictures that they show the remains of a weather balloon and a rawin radar target. There is no sign of any other debris in the pictures and certainly nothing that could be considered alien. 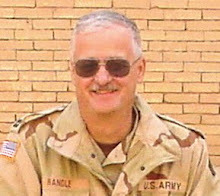 I hadn't realized that the pictures of Ramey would become so important and there would be a few who thought you can't understand this without seeing the "missing" Ramey picture. There has been an offer to share this picture with others, though it seems that permission must be obtained from another, I found this which came out of the trip to the University of Texas at Arlington in April. It certainly won't appease everyone, but at least you all can have a look at the missing Ramey photo that apparently only appeared in the newspaper and that the negative is not available. 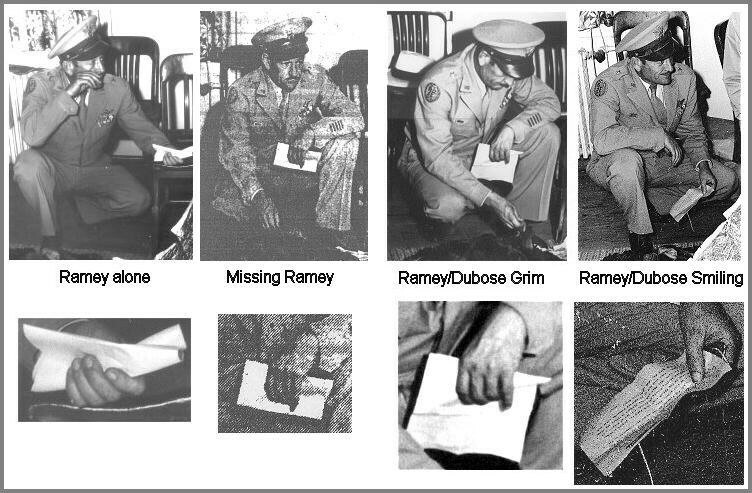 The Ramey/Dubose pictures are obviously those of Ramey and Dubose with Dubose cropped out. The missing Ramey is from the newspaper. So now all four pictures taken of Ramey are available here. I will note, for those interested, that the copyright is the University of Texas - Arlington Special Collections, and this particular piece is a composite that is not available online. Further copyright belongs to David Rudiak who made the composite. It has long been the contention of those who worked with J. 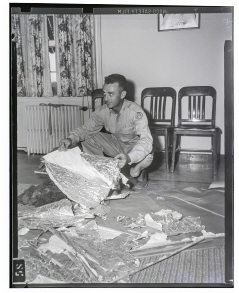 Bond Johnson on the attempt to read the Ramey memo that Johnson did not take the two photographs of Jesse Marcel holding up what looks to be debris of a weather balloon. I never really understood why that was so because the pictures seemed to be of the same quality as those that Johnson did say he took. in Ramey’s office that the pictures of Marcel were taken at 3:15 p.m. and that would have been Tuesday afternoon, July 8, 1947. Given the timing of the events, as they have reconstructed them, this means that Johnson couldn’t have taken those two pictures. And, if their estimate of the time is correct, then their assumption is also correct. I have never understood exactly how they made this interpretation. They talked of measuring shadows seen outside of Ramey’s office, but I don’t know if they had ever been to the base to make measurements, if the building in which Ramey had his office can be identified if it is still standing and how they determined the precise angle of the sun on July 8, 1947. What it is today doesn’t necessarily match what it would have been in 1947. Or, to put it in fewer words, I believe they made many assumptions to come up with the conclusions they wanted. Here’s what we know based on the documentation. According to the time line published in the Daily Illini on July 9, the first of the AP alerts sounded at 4:26 p.m. Central Time (Fort Worth), or 3:26 Mountain Time (Roswell). 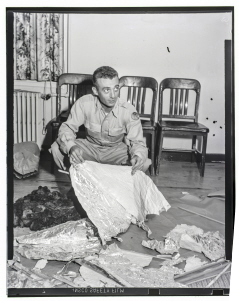 Since Johnson had said, repeatedly he learned of the debris coming to Fort Worth from his editor and it seemed that the editor had the news bulletin, that means Johnson couldn’t have received word until after the Marcel photographs were taken. The RPIT has concluded that there was another photographer there about two hours before Johnson arrived. It was this other photographer who took the two pictures of Marcel. 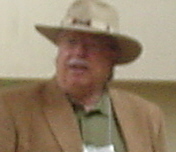 Johnson at one point said that another fellow who worked at the newspaper in 1947 said that Ramey owed them a favor and had called the Star – Telegram to alert them about the situation. It was this man, never identified by Johnson or anyone else, who had taken those first pictures. The problem here is that no one has ever come forward to claim to have taken the pictures of Marcel. After all the publicity surrounding these events, after all the times the pictures have been shown on television or published in books and magazines, it would seem that the man (and since this was 1947 I’m assuming it was a man) would have appeared to tell us that. 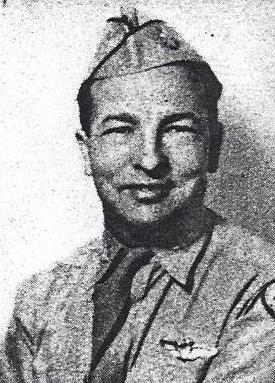 Johnson, after all, and according to his own words, had been to Fort Worth to try to find his pictures after he had seen them on a television show or two. And then there is where the negative of Marcel was filed. It was in the same envelop at the University of Texas – Arlington Library Special Collections as those of Ramey. That means the picture came from the Fort Worth Star – Telegram and that means they were taken by a photographer from that newspaper. 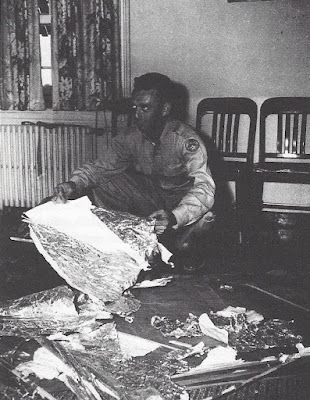 But, again, according to Johnson, he claimed more than once he was the only one dispatched from there and to hear him tell it, he was the only one who took photographs in Ramey’s office, overlooking or belittling the picture of Irving Newton crouched in front of the same debris in relatively the same locations as it appears in the other photographers. There is something else in all this. Johnson said that when he returned to the newspaper office, there was a “whole barrage” of people waiting for him. These were technicians from Dallas who had brought transmitting equipment to Fort Worth so that they could send a picture over the news wires. Johnson was told to develop the film and bring out a wet print because they were in such a big hurry to see what had been found and to get it out over the wire. of Marcel, would have gone out over the news wire probably before Johnson could have returned to his office in Fort Worth with his pictures, though there is no evidence of this. While Johnson’s pictures would have been important because they would have been different, they wouldn’t have been so critical that his editor wanted a “wet” print. They could have waited for Johnson to dry them properly. And, there is no indication from any of the archive services that any other picture, except the one of Newton which is clearly different than those first six, were ever taken. Johnson had to be the photographer and the estimate of the time of the photographs based on looking through a slit in the curtains of Ramey’s office seems to be an amazing bit of deduction. The documentation from the time, Johnson’s own recollections of what he had been told and then related to me in the first two interviews he had ever given (yes, I was the first to interview him… I know this because I found in my notes that I had asked him about it and he said that no one had ever interviewed him) that Ramey told him it was a weather balloon, and what was written in that very first article in the Star – Telegram, sinks much of what he said later. I won’t even bother to go through all of that again. Much of the information gathered in those first two interviews appeared in the International UFO Reporter (March/April 1990) and (November/December 1990). These articles outline the first interviews with Johnson and our (Don Schmitt and me) attempts to make some sense out of everything. The second article outlines the alterations in Johnson’s statements after his “interviews” with Bill Moore and Jaime Shandera. The critical interviews, that is, the ones I conducted are on tape. The trouble here is that Johnson told so many stories, modified, changed and deleted information almost at a whim. We can believe the things that are corroborated by others and documentation and we can reject nearly everything else. 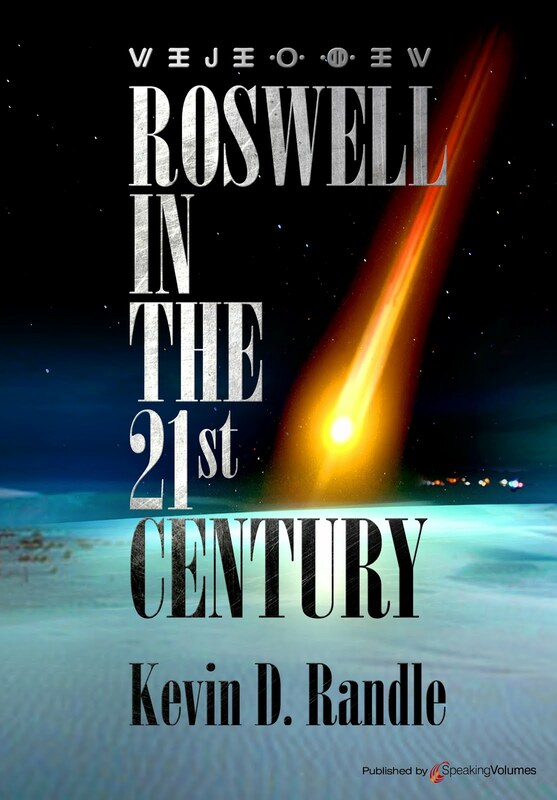 Johnson’s desire to become an important part of the Roswell story ended up changing him from a valuable witness into just another clamoring for his fifteen minutes of fame regardless of the facts. by the University of Texas at Arlington. newspaper articles that appeared in 1947… though in the first interview he actually reads the July 9, 1947 article that he claimed to have written. Or, in other words, he was not called cold. 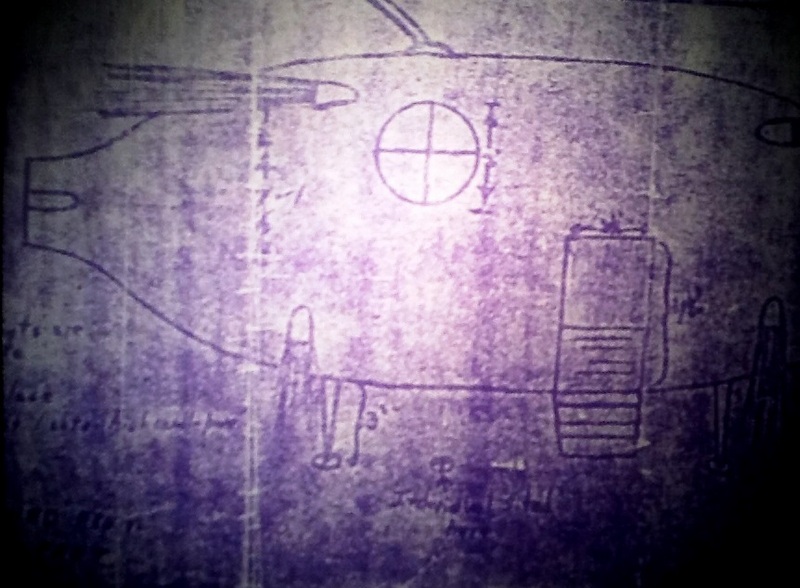 There are other indications in that interview that he had already reviewed his “UFO” file, that he had talked to Betsy Hudon at the University of Texas at Arlington, and he was aware that she had forwarded a copy of my letter to him which gave him my telephone number. She wouldn’t tell me who he was but she did say she would forward a letter to him to facilitate our communication. My name is initial J Bond, it’s also James Bond Johnson. I’m the original [referring obviously to the master spy by the name of Bond, James Bond). I was a reporter and back up photographer for the Fort Worth Star-Telegram in July 1947 after having served in the Air Corps as a pilot-cadet in World War Two. On the… Tuesday, July 8, 1947, late in the afternoon, I returned from an assignment to my office in the city room of the Fort Worth Star-Telegram which was both a morning and afternoon newspaper. My city editor of the morning paper ran over and said, “Bond, have you got your camera?” I said, “Yes,” I had it in my car. I had a four by five Speed Graphic that I had bought recently and I kept it in the car because I was working nights and police and so forth and had it at the ready. He said, “Go out to Ramey’s office and, he said, they’ve got something there [and] that to get a picture. I don’t recall what it he called it. He said they’ve flown something down… I don’t think he called it something… he gave it a name because I was kind of prepared for what I was going to see. 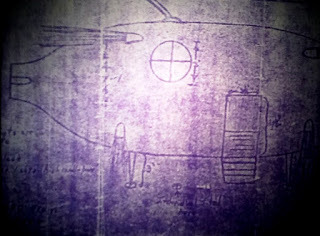 He said something crashed out there or whatever and they’re… we just got an alert on the AP wire [emphasis added to prove a point] … though it might have been the UPI… that the Air Force or the Air Corps as it was called then [actually it was the Army Air Forces in July 1947] is flying it down from Roswell on orders from General Ramey. It would be located in his office. It was or would be by the time I got out there. So I drove directly to Carswell [Fort Worth Army Air Field in July 1947] and my recollections now are I went in and I opened my carrying case with my Graphic and I had brought just one holder with me with two pieces of the 4 X 5 film. Black and white of course. I posed General Ramey with this debris piled in the middle of his rather large and plush office. It seemed incongruous to have this smelly garbage piled on the floor… spread out on the floor of this plush, big office that was probably, oh, 16 by 20 at least. 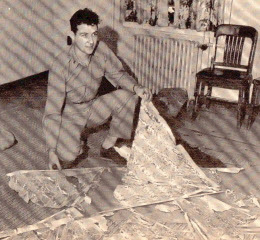 I posed General Ramey with this debris. 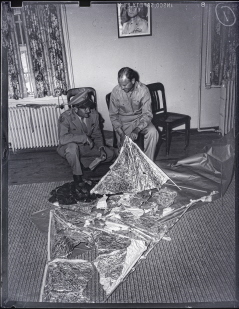 At that time, I was briefed on the idea that it was not a flying disk as first reported but in fact was a weather balloon that had crashed. I returned to my office. I was met by a barrage of people that were unknown to me. These were people who had come over from Dallas… In those days, any time we had… we normally bussed any prints that we were sending to the AP, we bussed them to Dallas to be transmitted on the wire photo machines. We had a receiver but not a sender in Fort Worth in those days. And no faxes. This then should end the idea that Ramey invited anyone out to his office. The story was on the news wire and the astute editors and reporters would think of calling Ramey on their own. He received telephone calls from far away and even did a telephone interview with a reporter on the West Coast. The idea that it was a weather balloon quickly killed the story and just hours after it broke on the news wires the interest faded. But the point is that Ramey did not call anyone and invite them to his office. The testimony and the evidence negates that idea. Johnson may have well taken the teletype alert with him but we don’t know. He might well have taken it into General Ramey’s office but we don’t know. The evidence for that is contradictory because Johnson spun many tales about what he did and didn’t do in General Ramey’s office. However, given what we can prove, it would seem that we no longer have to speculate about the reason Johnson went out to the base. While most of the new scans have been provided to a number of people including several skeptics (though some of them suggested they weren’t all that interested in pursuing the Ramey memo) we haven’t had a chance to learn of their results if there are any. 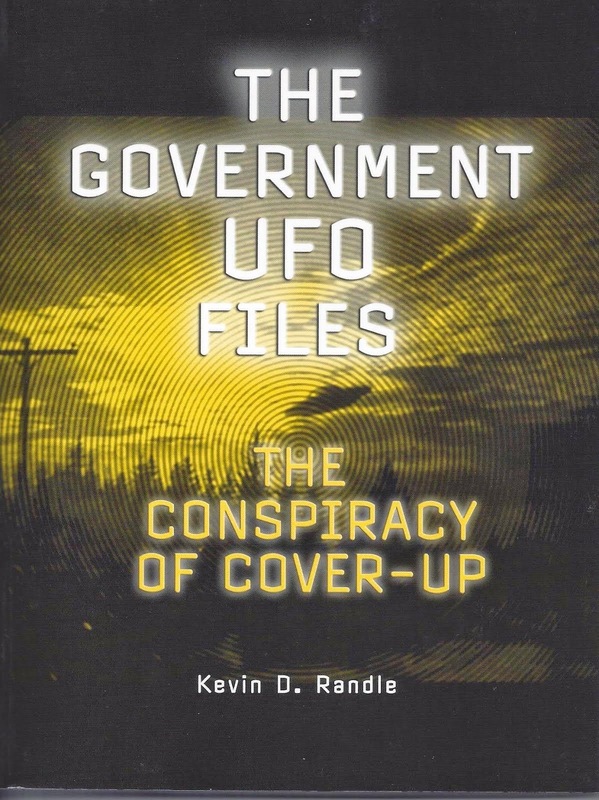 which is UFO Historical Review No. 13, September 2009). I have to admit here that (a) I also have some of those old 3-D glasses and I tried it as well, and (b) yes, it did seem to enhance some areas of the Ramey memo. Greenwood wrote, “A few words like ‘…AT FORT WORTH, TEX.” And ‘THE ‘DISC’…” seem to stand out enough to gain a general consensus to these decipherments.” I have to agree with this. Those words do seem to stand out a little more clearly but for those who visit here regularly, notice that Greenwood did agree with those earlier interpretations. For those interested, the work continues, but the problem is that the going is slow. I had hoped to have all this wrapped up months ago with everything easily available. We are attempting to get it out there now. Any suggestions on how to do this will be appreciated.